Here is my recipe for a family favorite that is TRIED and TRUE! You can not go wrong with this recipe and if it’s a recipe I’m recommending you know it has to be quick and easy. Please meat in cooker (no need to brown first). Mix flour, salt and pepper and pour over meat; stir to coat meat with flour. Add remaining ingredients and stir to mix well. Cover and cook on low for 10-12 hours or high 4-6 hours. Stir stew thoroughly before serving. I usually serve this with delicious Garlic Bread made in the bread machine. Doesn’t get any easier than that! This sounds wonderful. I LOVE stew! Especially with homemade bread 🙂 Thanks! 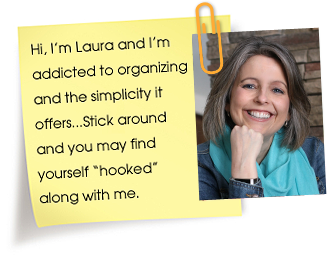 Laura, you should post your blog feed so those of us who use RSS readers can subscribe easily. Thanks! I love making stew and have never thought of canned potatoes…thanks for this tip! Thanks for linking this! It sounds great! Hey Kel, yes I definitely think it would work. Maybe do a little less though because you don’t want it to end up too thick. I often just use rice flour as well. 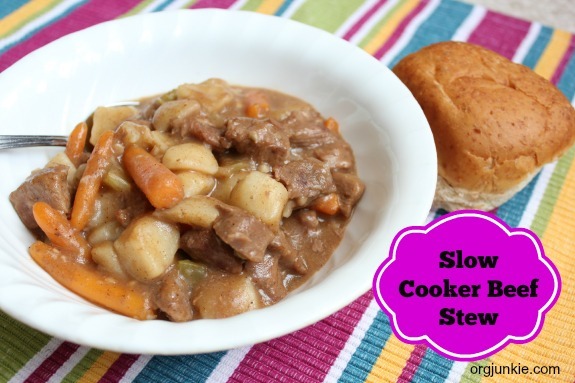 Just a quick question regarding your Slow Cooker Beef Stew…do you drain the potatoes before adding to the stew? This sounds great! We are buying a half side of beef soon, so I think we may have to give this a try! I made this last night. It was delicious. I had never used canned potatoes, but they were excellent, they really didn’t get soggy. The only thing was the recipe could have used more liquid. Mine wasn’t really a stew, you didn’t need a bowl and couldn’t use a spoon. But wonderful eaten on a plate with a fork and knife! 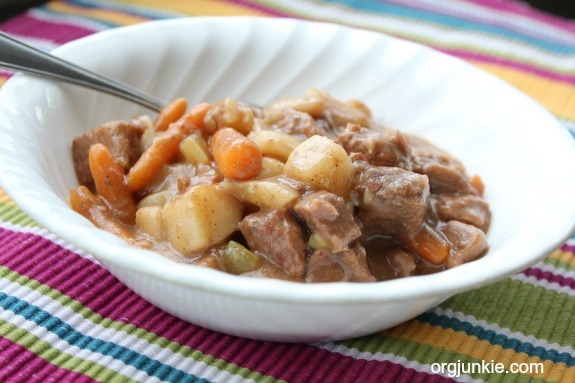 i’ve been searching for a hearty beef stew recipe (like the old dinty moore beef stew, but healthier). i’m going to give this a try! thanks! I really like the fact that I don’t even have to buy anything for this recipe! Well, I might have to buy some more celery, but hey! Nothin beats a recipe that I don’t have to spend a lot of money on! Also, I read somewhere that if you’re out of worstershire, you can use A-1 sauce instead. I tried it with a recipe and it turned out pretty good! I’ve been looking for a nontomato beef stew and look forward to this! Do you think that I could do this as a freezer meal? If I put everything in one container and froze it, do you think that I could take it out, thaw it and then put it in the crock pot? I’ve never tried that myself but it’s definitely worth a shot. Let me know how it turns out. In the picture you have mushrooms in your stew. Did you cook these in the slow cooker as well? Yes I had some fresh mushrooms leftover from a fondue so I just threw them in as well. They cook up great in the slow cooker. Do you drain the cans of potatoes? I made this last night and it was delicious. I had already seasoned the meat before freezing it as I had intended it for another dish – but it just added more flavor. Also I didn’t have cans of potatoes, I used raw. If you peel and halve them and then soak them in water – while you are preparing the rest of the dish – I find they don’t get mushy in the crockpot. Thanks for a delicious recipe. So glad you like it and thanks for the tip on the potatoes!